IT teams demand best-of-breed tools to deploy, secure, and report on every device in an enterprise environment. Microsoft’s Systems Center Configuration Manager (SCCM) is one such tool for managing Windows computers. But its capabilities are limited on the Mac. 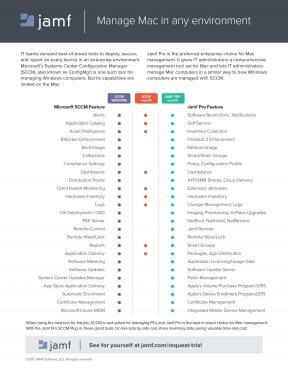 Download the PDF to see a side-by-side comparison of SCCM and Jamf Pro to discover why Jamf Pro is the preferred enterprise choice for Mac management.